the originals and secondly, the size of the map on the computer screen depends on the size of the monitor. North is diagonally up towards the top right corner. called the Shire of Dun Britton”. are shown as little red houses. Blawathill (sic) is shown a bit out of place and should be further to the left of Jordanhill. Note the odd spellings of “Partnick”, “Yockyrr”, “Milgay” etc. Oddly the name “Jordanhill” is rather far away from the little house to which it refers. to the right of Jordanhill House is the County Boundary following the Whiteinch Burn. a map of Glasgow, there is virtually no detail to the left of the wiggly line. 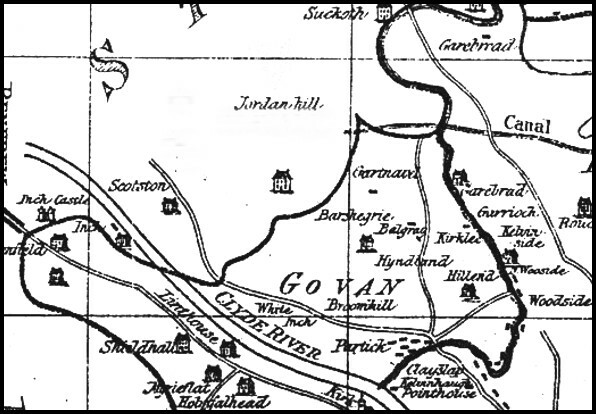 The Parish of Govan is shown to the right of the wiggly line. The area below the line in the very bottom left corner is in Renfrewshire. Extract from Thomas Richardson’s map dated 1795.
to Andrew Houston of Jordanhill, who was Richardson’s patron. “A Houston Esq” can be seen below the detail of the house and gardens. Muttonhole, to the left (west) of Jordanhill, is now known as Scotstounhill. 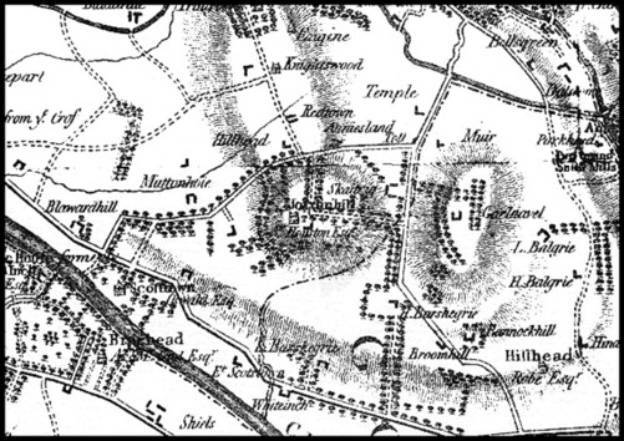 of Jordanhill was later the site of the original Jordanhill Church (known firstly as Hillhead Free Church). The Hillhead in the bottom left corner is the Hillhead area of Glasgow as we know it today. The road to the left (west) of Anniesland Toll is now Anniesland Road. Great Western Road is a much later route. Other current names can be seen, Scotstoun, Braehead, Knightswood and Temple etc. This map is dedicated to the Lord Lieutenant of the County of Renfrew. Since this map is about Renfrewshire, there is very little detail to the right of the county boundary. until it reaches the word “Newton” and then becomes a wiggly line making its way to Whiteinch. Again, A Houston Esq. 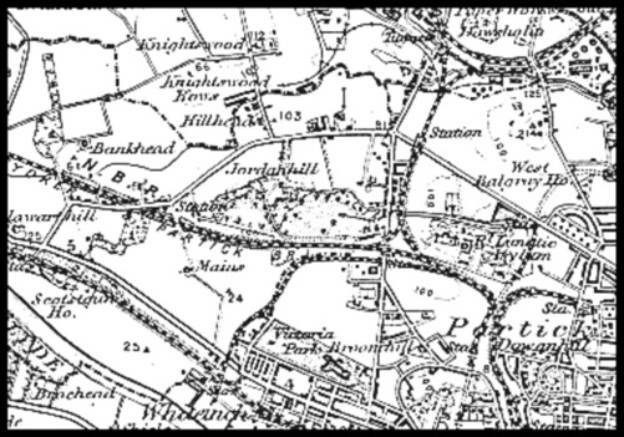 is shown beside the name Jordanhill. 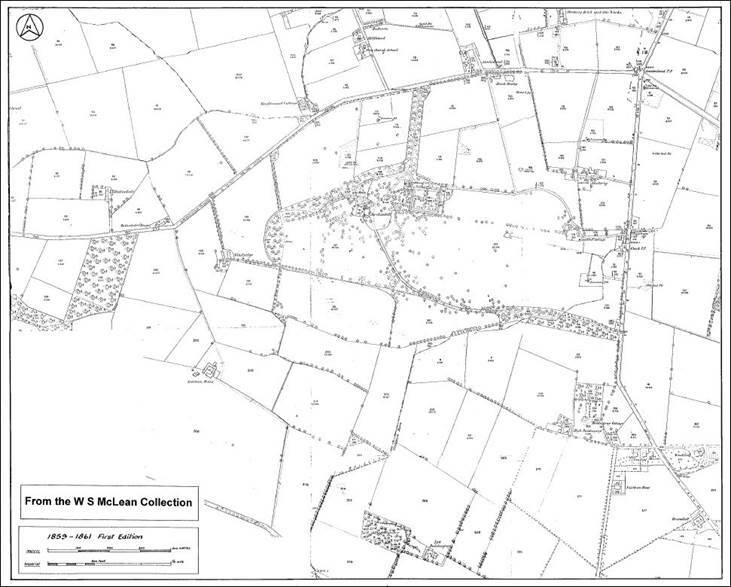 “Southbrae” is shown below (southwest of) Jordanhill but it does not appear on any other maps. Great Western Road (east of Anniesland Toll only), Knightswood Rows, etc. the railways around Jordanhill will be found on another web page. The popular 1¼ inch to 1 mile maps currently published by the Ordnance Survey are readily available in shops, and some sports outlets also sell the Pathfinder Series to the larger 2½ inches to 1 mile scale. It is also possible to obtain even larger scale maps which are required for legal and administrative purposes, such the preparation of planning applications, and these large maps are generally 1/2500 scale. (about 25 inches to 1 mile). The OS map shown above for 1895 is to a scale of 6 inches to 1 mile and shows a lot of detail compared with earlier maps. However for detailed historical research covering the last 150 years, when most of the major changes occurred, it is convenient to use 1/2500 scale maps which give a “snapshot of the area frozen in time”.. In 1859 the Ordnance Survey published the First Edition of these extremely detailed 1/2500 series of maps plotted to a scale of 25.344 inches to a statute mile, which is 208.33 feet represented by one inch. They show every field boundary, county boundary, house, burn and road etc. Each field and individual plot of land is given a reference number and its area in acres. 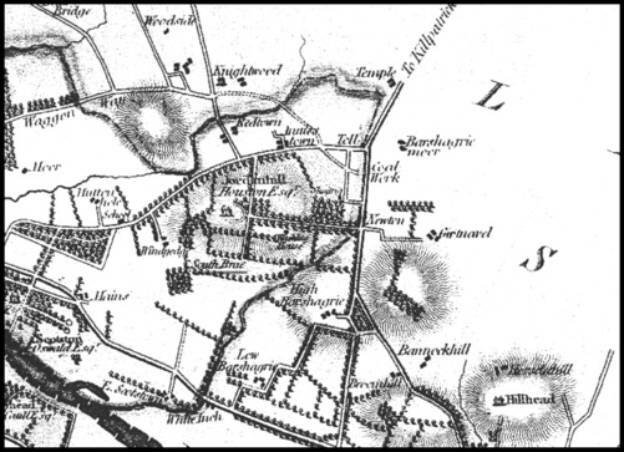 This first edition series was also referred to as the “County Series” because they were printed in parts according to the county in which a particular area was located so to obtain a complete map of Jordanhill requires extracts from Lanarkshire and Renfrewshire maps. The maps were printed on thick paper measuring 41 inches by 19 inches (1.04m by 0.74m). The Second Edition was published in 1895, the Third Edition in 1913 and thereafter in 1932, 1948, 1964 and at intervals right up to the present day. In 1980, I obtained a full set of the 1859, 1895, 1913, 1932, 1948 and 1964 maps to cover Jordanhill and these are invaluable in tracing changes and developments over the years. Many of the webpages on this website contain extracts from these old maps with the field numbers, spot levels and other extraneous details removed. To close this webpage on old maps, the next map is just over 30 years old and could be more accurately described as a plan due to the large scale. It is drawn to a scale of 1/500 (1 ft to 500 ft or 1m represents 500m) which is commonly used for detailed road design by civil engineers. The chosen area of land is photographed from the air using sophisticated stereoscopic cameras, the photographs are then interpreted by specialists using complex equipment and most details are plotted on a stable transparent medium. A ground survey team then checks these initial drawings and fills in any gaps. 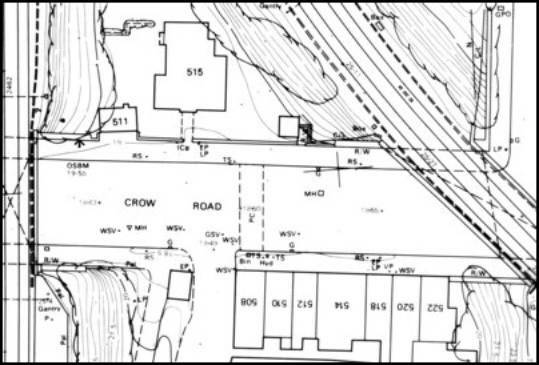 This small extract was produced by BKS Surveys Ltd in 1972 in connection with the Crow Road Improvement Scheme, it covers the short length of Crow Road between the bridges at Southbrae Drive and shows the former old lodge between the bridges. Note the small details, LP for lamp pole, G gulley, RS road sign, MH manhole, RW retaining wall, GSV gas stop valve and so on. The contours are plotted at 0.5 metre intervals. Anniesland Cross is to the right, Southbrae Drive is at the top right and the present row of shops including Pablo’s is on the bottom edge. The broken lines across Crow Road at No 508 represent a long-gone pedestrian crossing.